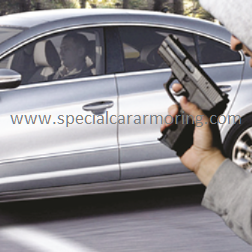 MSCA - M Special Car Armoring is proud to offer its customers additional products for their personal protection, the protection of their family members, and their security personnel. MSCA provides Bullet proof vests of the highest quality for its VIP customers and their security personnel. A special glass that can withstand multiple repetitive impacts from harmful objects such as bricks, stones and hammers. It will not show optical defects or modify the visibility conditions of the glass. It is as thick as the vehicles OEM glass.